The World Cup match between Iran and Spain will start in less than 24 hours. If you missed the announcement, please read it before participating in this contest. How to cast your bet for this match? Upvote ONE of the comments made by @steemitboard under this post. UPVOTE the comment "IRN - Iran win". UPVOTE the comment "ESP - Spain win". Will it be a tie? UPVOTE the comment "TIE - No winner". Your upvote must be done BEFORE 2018-06-20 18:00 UTC to be valid! DO NOT WRITE COMMENTS WITH YOUR EXPECTED RESULT! All bets made via comments/replies will be ignored! 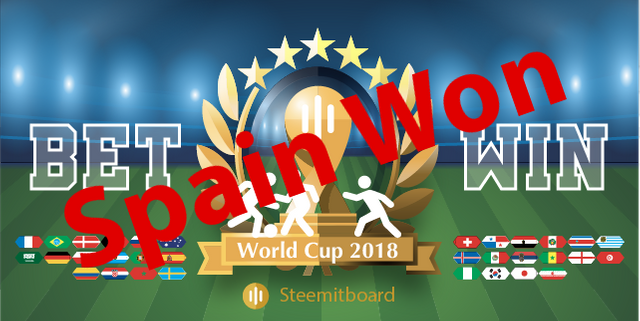 Do not forget to register the contest by sending 0.010 SBD or 0.010 STEEM to @steemitboardpool with "worldcup2018" in the memo. This is a one time registration. You can join the contest at any time, but the sooner you get in, the more chances you have to win the 1st prize. Only one vote will be taken into account. If you remove your vote and/or vote for another result, you will be disqualified for this match. Think twice before voting for your result! Votes cast after the scheduled start time of the match will be rejected. Be careful, all times mentioned in this contest will be UTC based! Good luck and enjoy the World Cup 2018! The actual pool size is 1700 SBD thanks to our generous sponsors. All of them are witnesses, therefore kindly consider voting for them if you have not done so yet! Upvote this post and support our work to bring fun to Steemit! READ THE RULES - DO NOT REPLY TO THIS COMMENT! Replying to this comment will be considered a fault. You will receive a red card (flag) and excluded from the match (no badge)! Which came first hen or egg?